Are You Helping Or Hurting? Intellectual Giant Sets Me Straight! I take notes on everything. This was my third time hearing Dr. Brian Fikkert - an intellectual giant (literally!) in the humanitarian aid world, and co-author of the best-seller When Helping Hurts. And still things were jumping out at me that I just had to write down. But that’s what you do when a 6’10” Dutchman is hollering at you from the stage. You at least write it down! 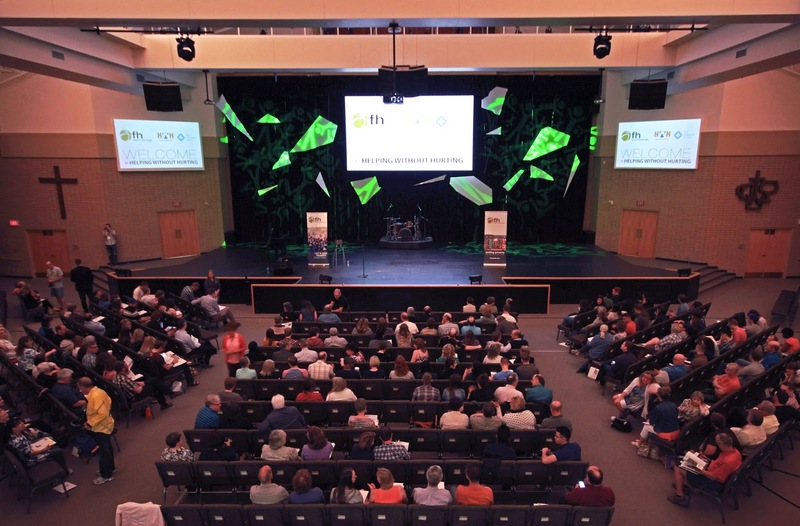 I was one of over five hundred attendees at the Helping Without Hurting one-day conference held May 23 in Calgary, AB. “Good intentions are not enough!” I’ve quoted this statement time and again since first hearing it. But it takes just an extra second of thought to really process what that means. So often we tote a ‘giving spirit’ as reason enough to do something - dropping a fiver in an outreaching coffee cup, putting my sack of used t-shirts in the “Save Kids in Africa” drop bin, building a home for someone in Tijuana. I’m not saying these actions are wrong, but they might not be the best way to help those I want to reach. Dr. Fikkert challenged me to not just do good, but to do better. I wasn’t the only one who had come back to HWH for more. Paula Cornell, a social worker from Edmonton, drove three hours for the event and was again struck by what a shift in perspective could mean for the local Christian community. Paula spends a lot of time with Canadians in tough places and helping educate Canadians about those tough places. She left the weekend feeling refreshed. “It gives me some hope for a sometimes bleak-looking situation,” she said. More than once the audience was reminded to consider anyone we are trying to help as a peer. This means seeing them as like me - created by God and just as valuable a human being, deserving of friendship and respect. As a peer, this person has something to give - they too can and want to develop and exercise their abilities. How dare I not let someone use the gifts and talents they’ve been given! A great addition to the day was two times of worship led by Jon Neufeld (that guy has a voice!). In the midst of so much self-analysis and thought-provocation and academic material, it was more than just a break; it was refreshing to have time where we could just sing out to God. The day ended with a panel discussion featuring some pretty smart characters. Noting their credentials, I didn’t doubt it would be good. Dr. Stephen Wile of The Mustard Seed Calgary, Dr. John Rook of Ambrose University and the Jaffray Centre for Global Initiatives, Pastor Ed Temple of Foothills Alliance Church, President Bernie Willock of Food for the Hungry Canada, and the day’s speaker Dr. Brian Fikkert representing The Chalmers Center. I have to add that while everyone else was given a tall stool to perch on, Dr. Fikkert was put on a chair at the end. Remember, he’s 6’10”. To keep the “playing field” level, so to speak? During the panel, the audience lit up with questions - it was perhaps the highlight of the day for many attendees seeking practical application. Questions about the effectiveness of Child Sponsorship, issues with fair trade and micro-finance, the importance of women in leadership, and other topics were applied to the concepts Dr. Fikkert enthusiastically shared that morning. This was Dr. Fikkert’s fourth time presenting to a Canadian audience and, yet again, he was thoroughly impressed with the kind disposition and deeply thoughtful approach to poverty alleviation we Canucks have. Now that I’m reminded of what a healthy approach is to helping, I better do something about it. So what am I going to do? First, take time to think. Like really think (But not too much - I still want to take action). I’m involved in several local and international agencies and church ministries. I must consider what little things I can change. Second, make those personal changes. I might even write them out. And remind myself of them often. It's a cliche statement, but change must start with me. Food for the Hungry: Are You Helping Or Hurting? Intellectual Giant Sets Me Straight!